In applications where the whole atmosphere poses a potential risk, the automation of process control systems can prove challenging. 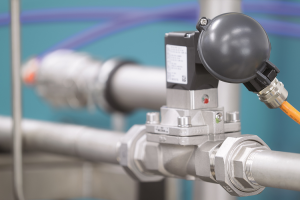 Process Industry Forum spoke to Paul Hobden, Bürkert UK ATEX solenoid valve champion, to find out how explosion-proof solenoid valves can help to overcome these challenges. Designing process control systems that meet DSEAR, ATEX and other similar standards require considerable levels of expertise and competence to deliver a suitably compliant process that meets the demands of the application. When it comes to creating a new, fully certified installation, it is important to select partners that understand process control design with the ability to deliver bespoke solutions using the latest technology that is certified to the standards in force locally. Bürkert Fluid Control Systems is one of the leading manufacturers of control and measuring systems for fluids and gases, with over 25 years’ experience in delivering solutions for hazardous areas in a wide range of industries and applications. As part of its development of ATEX and IEC-Ex certified versions of its industry-leading components and systems, it has established a centre of competence in Menden, Germany. Bürkert not only designs a comprehensive range of solenoid valves to cover both standard and specialist applications, but it also manufactures every component. This includes the machining of the valve body, the injection moulding of the coil body and the manufacture of the coil itself. In this way, Bürkert has control over every aspect of the valve and so can guarantee its performance. For more information about their range of ATEX approved solenoid valves, please contact Bürkert today.